Jackie has been coaching and training at CSA GYM for 8 years now and has competed in The Crossfit Games Regionals for 6 years. Her goal is to make it back out there as an individual. Training is more than just reaching for regionals for her. Training has become her way of staying mentally and physically strong and her way of building confidence so she can continue to crush her goals outside of the gym. Her training consists of 5 days on 1 active rest day and one day completely off. She does a weightlifting program, The barbell Wod, Monday, Wednesday and Friday in the morning and goes back to the gym for crossfit training in the evening. Tuesdays and Thursdays she does Powerlifting at noon and Crossfit Training in the evenings. Getting a little bit better every day has become her passion along with coaching other athletes. Building her base strength has become the priority this off season. As a crossfit athlete you must be well rounded to get ahead so she has been taking the time to start from the bottom and build back up. 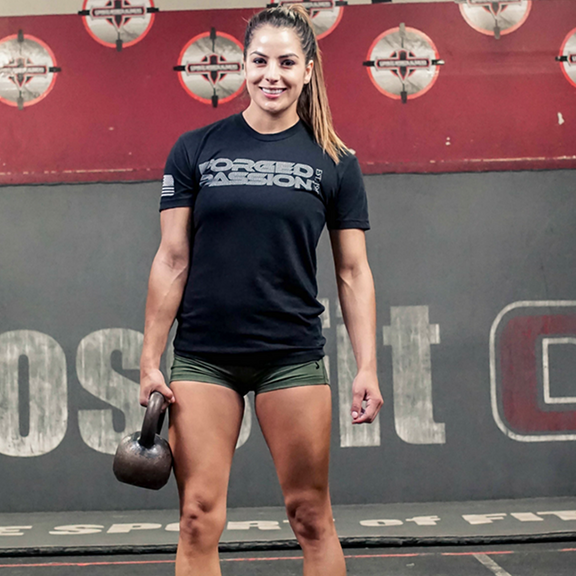 Her desire for getting stronger isn't only for crossfit. She likes being a strong female and hopes to be an example to the next generation so they are not scared to be strong. She wants them to see that a strong body gets you a strong mind and that becomes your confidence so you can take on the world every day and win no matter what life throws your way.